Design Goal: To create a custom filling station that reduces the time and spillage compared to the current Rubidium transfer process used by TRIUMF’s labs. Description: TRIUMF is one of Canada’s leading national laboratories for particle and nuclear physics. Its impressive facilities include a cyclotron, a particle accelerator used to bombard elements with proton beams. One of the elements processed in the cyclotron is Rubidium, which is used to produce Strontium-82 isotopes for the medical field. TRIUMF’s old filling station suffered from frequent spillage and clogs, and was tedious and time-consuming to operate. The new filling station boasts greater reliability, handling, lower process time, and simplicity. 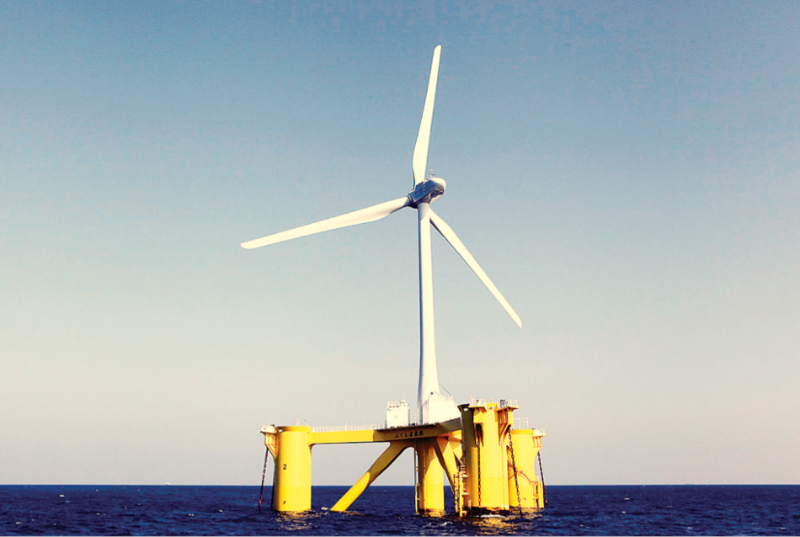 Design Goal: To design a scale model OC4 floating wind turbine platform that maintains stability in extreme weather conditions. Description: A scale model of the Offshore Code Comparison Collaboration Continuation (OC4) semisubmersible wind turbine was developed to help the UBC Control Engineering Laboratory develop advanced control algorithms for floating wind turbines. The design maintains geometric similitude through Froude scaling, has a sensor package that is able to detect the dynamic response of the platform, and has two mooring line designs for pool and lake mooring. The sensor package contains an Arduino microcontroller, a 9 DOF Inertial measurement unit (accelerometer, gyroscope, and magnetometer), and a GPS. 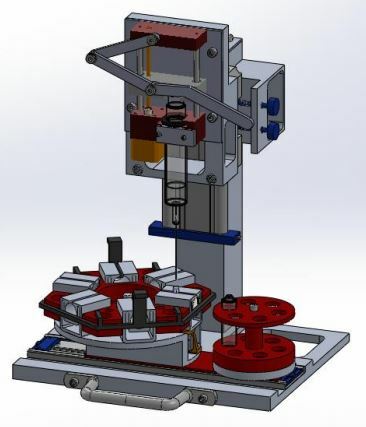 Design Goal: To develop an add on remotely operated underwater vehicle (ROV) gripper capable of harvesting fragile glass sponge samples from depths as great as 1000 feet below sea level. 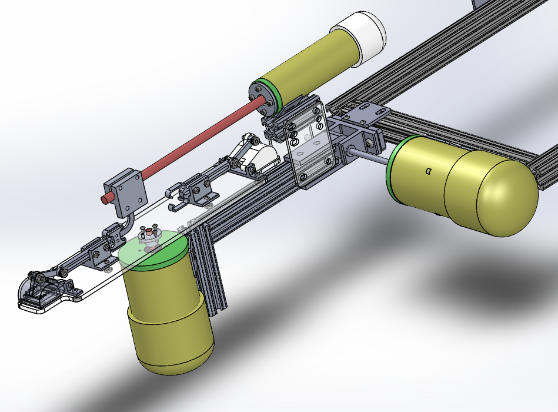 Design Goal: To redesign the drivetrain of UBC Supermileage’s urban concept vehicle to improve the fuel efficiency and improve its performance at the 2015 Shell EcoMarathon Americas competition. Description: Previously, the drivetrain has been comprised of a centrifugal clutch mounted to the engine with a chain and sprocket system transferring power to the drive wheel while reducing the speed. While this method has proven to be robust and easy to maintain, it has had its disadvantages. 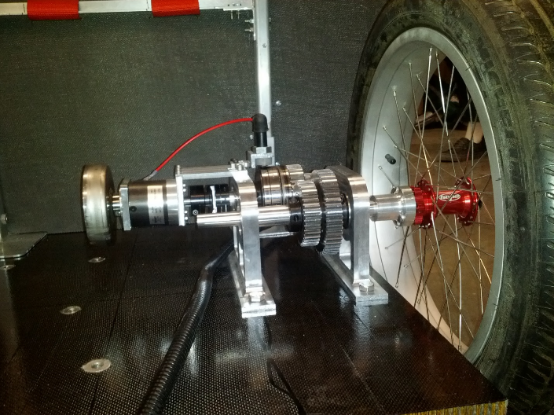 The team successfully designed and built one of the first, if not the first, two-speed transmissions to be implemented at the Eco-Marathon competition. The final design was a 2-stage, 2-speed, overdriving transmission using a custom centrifugal clutch, a planetary gearbox, an electromagnetic clutch, spur gears, and sprag clutches. Design Goal: To retrofit the Pneuman pneumatic pedaling robot exhibit at Science World to improve its reliability and reduce the required exhibit maintenance. Description: The original Science World Pneuman exhibit featured a pneumatically powered pedaling robot which travelled along an overhead track. The display had fallen into disrepair due to maintenance issues. The project will work with existing Science world exhibits by demonstrating mechanical components through auditory and visual means. A new interactive interface will engage the general public through a website (developed by the Electrical and Computer Engineering team) and inspire further interest in science for all ages. 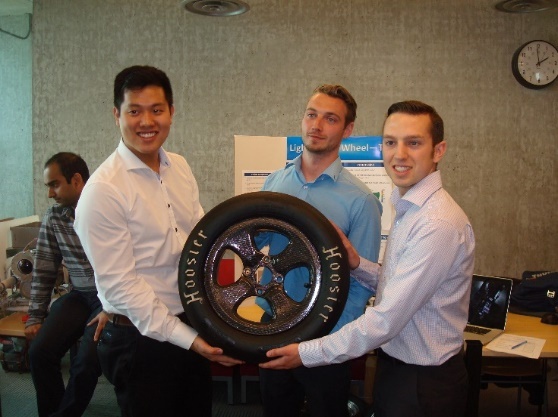 Design Goal: To design lightweight wheels for a Formula race car and analyze the effects of reducing wheel weight on performance. Description: A recent trend in Formula SAE cars has been to transition to lightweight wheels. Other SAE teams, as well as supercar manufacturer Koenigsegg, have already adopted the use of carbon fiber wheels and have experienced a great deal of success. Extensive FEA analysis was conducted to ensure the safety of the lighter wheels. A physical test rig was also fabricated to test the wheel’s performance compared to the traditional alloy wheel under radial, circumferential, and lateral loads. The design reduced wheel weight by approximately 60%. Design Goal: To devise a spooler unit that stretches and collects 3D printer filament properly. Description: Plastic Bank’s vision is to make plastic waste too valuable to be thrown out. 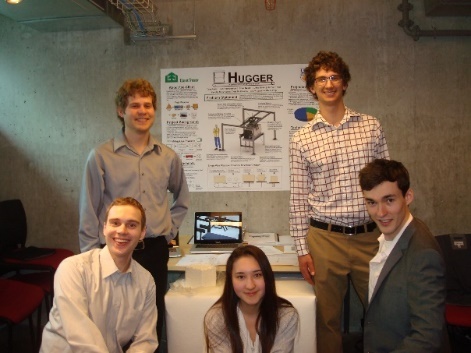 This project’s goal was to complement a plastic extruder designed by a previous year’s Capstone project. 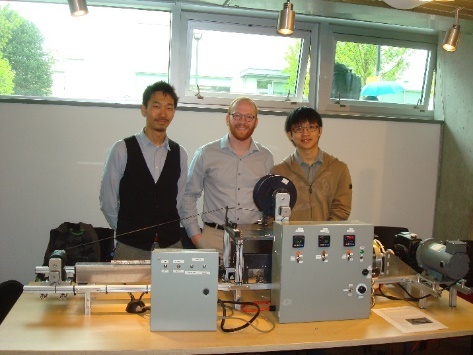 The filament is measured with a line CCD sensor, stretched by nip-rollers, distributed by a servo motor and firmly collected onto the spool by the use of a friction drive. These parts are neatly coordinated to ensure quality by utilizing PI-control. Design Goal: To design and build a device that allows people with limited upper body function to independently play fetch with their dogs. Description: The Tetra Society of North America is an organization that recruits skilled volunteers to create customized assistive devices for people with physical disabilities. The Wheelchair Ball Launcher is designed for people with limited upper body function to promote their independence while playing fetch with their dogs. The device is able to perform various functions such as launching a ball at various distances upon user input, accepting a ball from the dog and dispensing treats as a reward upon user input. The device is operable with minimum hand function both indoors and outdoors. 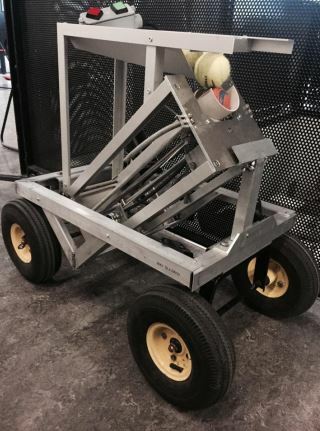 The ball launcher can be used with tennis and medium size Chuckit! balls, while the treat dispenser can be used with the standard size dog treats(1 cm3 ). Design Goal: To design a system that is capable of wrapping pulp bales with a single wire to replace the current two wire system. Description: Currently, pulp bales are wrapped with two sheets of paper wrap; one on top and one underneath. The packaging line secures both sheets with one wire, moves the bale along a conveyor, rotates the bale 90*, folds the ends of the wrap, and secures the folds with the second wire perpendicular in orientation to the first. At this point the first wire is rendered useless. The designed system allows pulp bales to be wrapped with a single wire as opposed to the current 2 wire system, at a rate of 4500 bales/day. Decreased wire costs, increased throughput, and increased margin on sales provide approximately $700k/year value to the client. 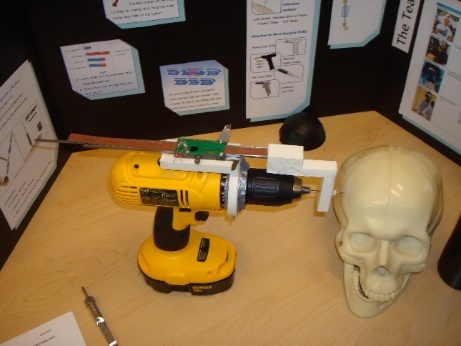 Design Goal: To develop a medical device that helps medical personnel to perform orthopedic and internal plate fixation procedures. Description: Internal fixation is the preferred method to correct bone fractures. Traditional depth gauges for internal fixation surgery are time intensive and often provide incorrect measurements, which can lead to surgical complications. The Drill-Attached Depth Gauge design can be attached to a variety of surgical drills and provides accurate measurements to the surgeon, all while reducing time spent in the operating room. 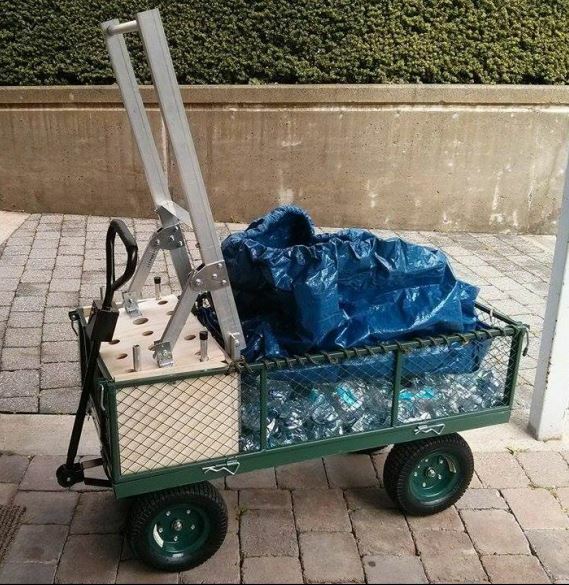 Design Goal: To design a low cost, lightweight cart to transport and compact plastic waste. Description: It is estimated that approximately 300 million tons of plastic are produced globally each year, with less than 10% being recycled. In developing countries such as Peru and Haiti, this number is reduced to less than 2%. For this reason, the recycling of plastic waste in developing nations represents a vastly underdeveloped industry. The Plastic Bank seeks to address this dire need for a global recycling solution while helping to fight poverty in developing nations by increasing accessibility to education, income, and recycled 3D printing services. The simple, robust design employs materials that can be easily scavenged from construction waste created in developing nations while minimizing machining and complex assembly in order to limit the construction cost to under 100 CAD per unit. 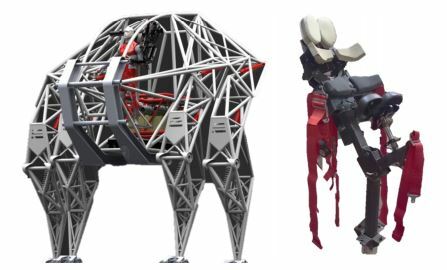 Description: Prosthesis-The Anti Robot is a giant walking robot, which is 3500 kg heavy and 5 m tall, designed and being built by the eatART group. The Prosthesis is actually a huge exoskeleton controlled by the pilot’s limbs that can reach a maximum speed of 30km/h. 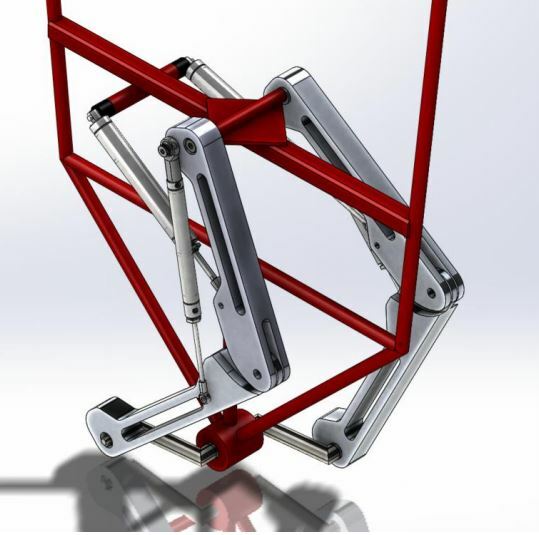 The designed harness constrains the pilot to the machine, allows necessary movement, mitigates discomfort and injury, and allows quick egress during unforeseen events. Because the Prosthesis is still evolving, the pilot harness system may have to adapt to future Prosthesis designs as needed. 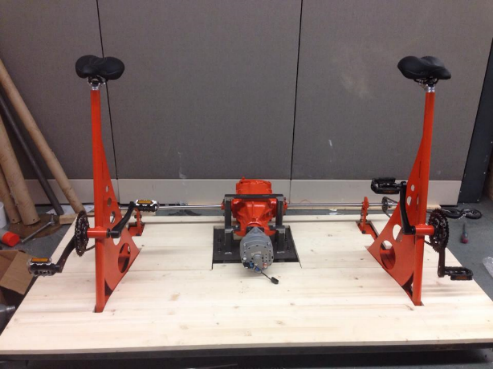 Design Goal: To create an interactive tandem pedaled power station to engage students in sustainable and active lifestyles. Description: Two users, connected by a car differential, will be able to generate their own electrical energy. The device turns mechanical energy into electrical energy. The differential is connected to an alternator which produces the electrical energy. The alternator is connected to a table that regulates the electricity. At the top of the table are electrical outlets and usb chargers. The differential allows an easier ride when two riders are on the device.